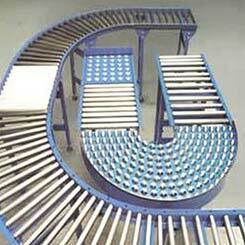 The Roller Conveyor System that we manufacture is of optimum quality raw material. The Heavy Duty Roller Conveyor being manufactured with steel varieties such as EN 8, EN9 and EN24 can withstand any amount of weight. Today, we are reckoned to be one among the major Industrial Roller Conveyor System Suppliers for providing quality product at affordable prices. They are found in a number of dimensions to meet the various requirements of the clients.